Contact us page is an important component of every blog, because it is through this page that your readers and other potential client can contact you. This contact us page need to be customize and set up properly. There are many web services that you can used to generate a custom contact form that you can put on your contact us page and most of this service are free . In this post am going to work you through on the how to create a nice looking and simple contact form that you can put on your contact us page. 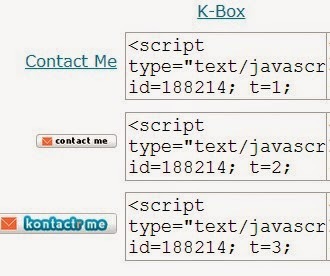 Am actually going to be using KONTAC web service for this tutorial because it is what am actually using on my blog. · Head over to kontactr.com. · Click on the sign up button, make sure you give the email address that you want to be receiving messages from your blog with you. I will suggest you used the same email address you used while opening your blog. · Fill the registration form and click the submit button, an email link will be send to your mail box, move over to your mail box and click on the message that was send to you by them , click on a link in the message to confirm your account. · Now head over to your blog dashboard and click on page option, if you already have contact us page, just click on it, switch to the html tab and paste the code there, and if you don't have the contact us page don’t worry just click on new page button., the contact us as the title of the page and paste the code in the next text area in the HTML tab. · Click on save or publish button. Now head to your blog and click on contact us page, a nice looking and simple contact form will appear on that page. Hope this tutorial has help some one out there.